Netflix is a top-leading video service, aiming at providing an amazing platform to fit for any taste, enjoying Netflix movies, TV shows online or stream it to your mobile phones, tablet, game console and smart TV, etc. However, to some users, it is not perfect enough owing to there is no official Netflix app allowing you to download any content on your own PC or Mac for later offline playback. It seems that there is a long way to go to wait for Netflix local support. But what can you do when you see a wonderful movie from Netflix and is longing for downloading it? The good news is that there are many 3rd party Netflix downloaders available to help you directly download the Netflix movies for offline playback. Alternatively, we are here offering another workaround for you. That is to use a powerful recording tool to capture videos from Netflix. To make it more clearly, we here will lead you to make Netflix recording easily with one of the most professional Netflix movie recording software called Joyoshare Screen Recorder. Working as one of the most professional video captures, Joyoshare Screen Recorder is dedicated to capturing movies from Netflix along with any other screen video activities with just few clicks. It adopts the most advanced screen recording technology on the purpose of bring the best experience to each user. 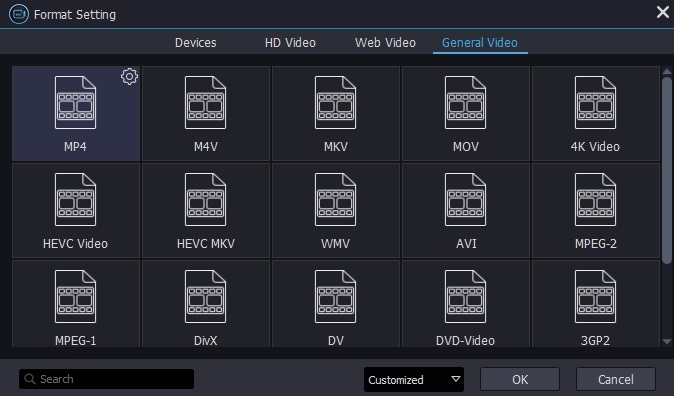 Joyoshare Screen Recorder is capable of capturing any videos as well as audios that are playing on your computer’s desktop screen. Stating in detail, it is accessible to record movies from Netflix, take any screencasts, make impressive video tutorial, capture streaming music, grab online games, etc. 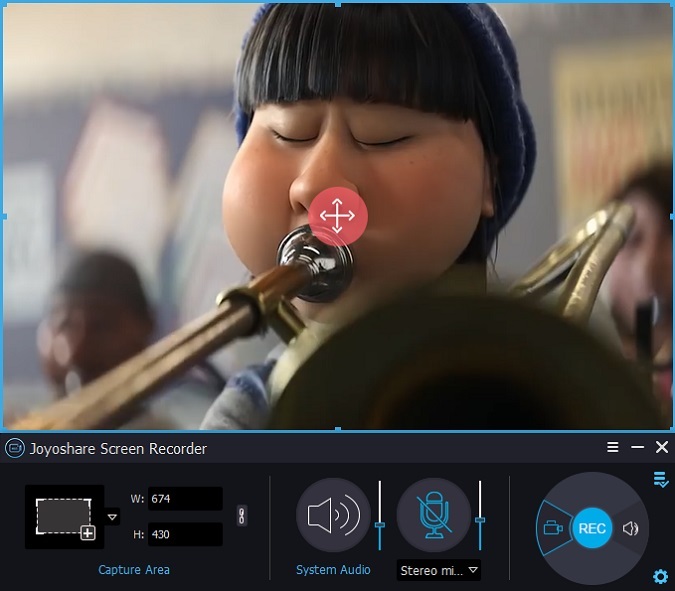 Bear it in mind that Joyoshare Screen Recorder is made up of video capture together with audio recorder, which allows you to capture Netflix video and audio track simultaneously. When act as a excellent recording tool for videos, it can output your Netflix video to M4V, MKV, MOV, MP4, WMV, AVI and more other formats. Meanwhile, your Netflix video capturing can be played on diverse devices, like iPhone, Andriod, Xbox and smart TV. About audio recorder, there are various output formats, including MP3, AAC, WAV, FLAC, M4A and M4B. What is worth to mentioning is that Joyoshare Screen Recorder is well designed with distinctive features. You are available to set up recordings in the way you like. Select capturing area based on your requirement, close system sounds, take screenshots, create a scheduled assignment ahead of time, choose output format, and even add effects to cursor, etc. No matter what you want, Joyoshare Screen Recorder can aid you. How to record movies from Netflix with Joyoshare Screen Recorder? By clicking the icon on your desktop to launch Netflix as long as you have installed it in advance, or enter Netflix official website in browser. Find Netflix movies that are going to be downloaded. Simply download and finish installation of Joyoshare Screen Recorder on your own PC so that you can access it to make preparation for recording. There is a "+" button located in "Capture Area" section on the top left corner. Click it and then adjust the capturing area. You are allowed to decide how large the screen area by choose any region on your desktop screen. Of course, you can directly preset standard ratio, such as 320x240, 640x480, 1280x720, full screen, etc, or enter a specific number to customize the size. 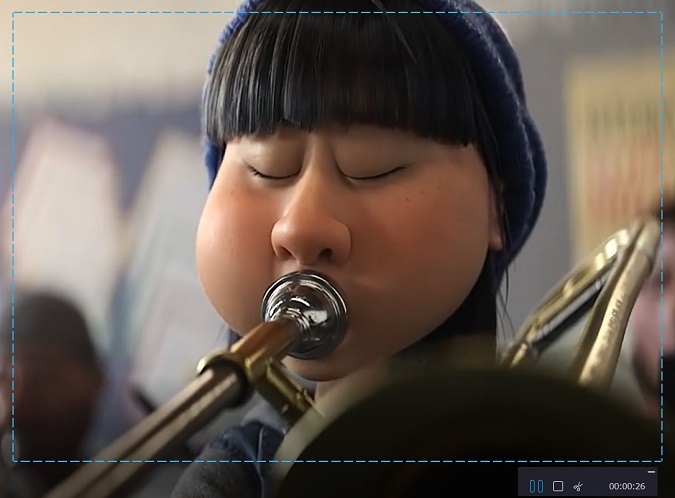 To record Netflix videos, Joyoshare Screen Recorder is supportable to make system audio or microphone sound left, with which you can easily remove unwanted sounds to avoid much noise being included in your Netflix recording. Moreover, Joyoshare Screen Recorder can capture Netflix video and audio synchronously. Under this circumstance, it depends on you whether to record both of them. Try it and you will be clear about how this function performs. Note: Joyoshare Screen Recorder can at the same time serves as an independent audio capture, which is well designed with an audio track icon on the right hand of the red button "REC". Unfold the "settings" option. 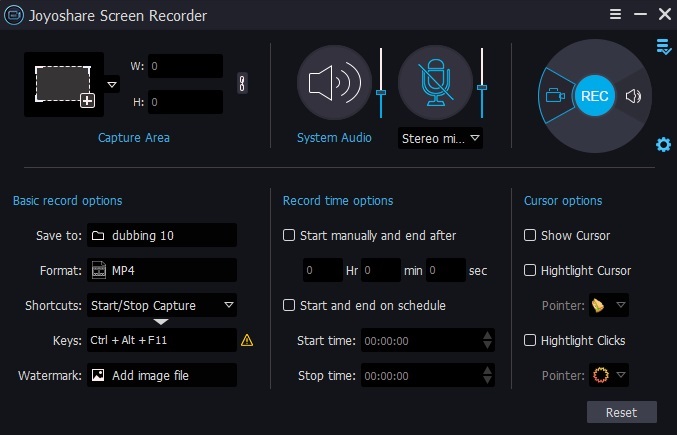 Joyoshare Screen Recorder layouts "Basic record options", "Record time options" and "Cursor options" to permit you to choose desirable output format, preset a scheduled task with definite start time as well as end time, add cursor effects, etc. Note: At present, Joyoshare Screen Recorder can support MP4, M4V, AVI, MOV, FLV, WMV, SWF, etc, together with abundant popular devices, like iPhone, Xbox, smart TVs and so on. Play the movie and click "REC" button to begin to capture Netflix movie, during which you are entitled to have screenshots at any time. 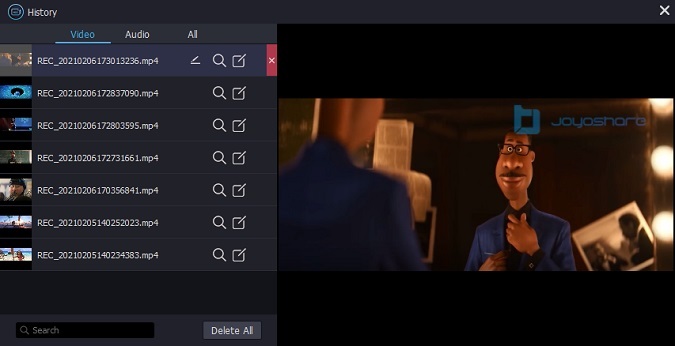 Preview any destination Netflix file on the list of "History" and manage it by editing its file name, revising ID3 tag information, such as title, album, year, etc.